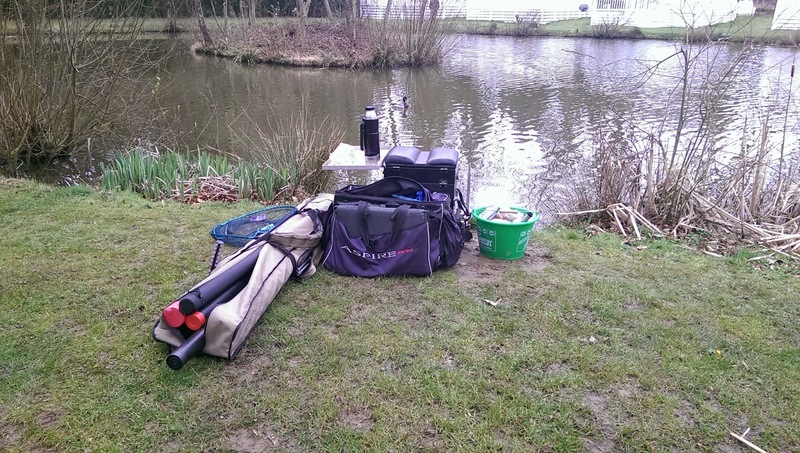 A family visit with a new dog meant it was only the one trip out for me this Easter break, and after some recent contact I was asked about fishing Lyons Gate fishery. Having never fished this venue and not really able to turn up much up to date info on the venue, I thought I should probably head over there and drown a few maggots so I could respond properly. Easter Friday was a bit of a murky affair and driving down the A356 with fogs and full beams seemed a bit of strange contrast to the blue sky and sunshine I had left less than 5 miles ago. Fortunately this started to lift as I passed over the A37 and by the time I got to the venue, it was very clear – albeit overcast. The overnight downpour also hadn’t dampened the campers spirits, the site was a hive of activity. There were loads of people walking back and forth and a lot of dogs being walked (but all on leads). It’s a fairly small campsite and I soon found the car park, and was walking around the lake surveying the options. 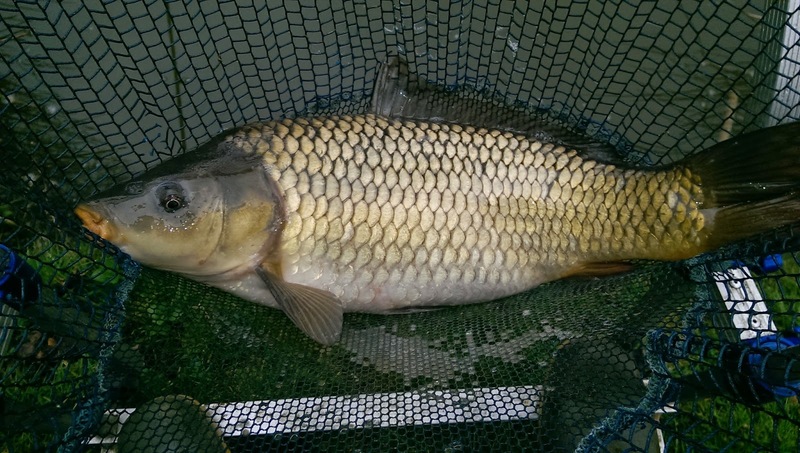 There are 4 lakes on the site, although I think only 3 are fishable, the biggest lake named “Kingfisher” was certainly the busiest, and I was quite surprised to see a number of bivvy’s and several carp rods. Apparently there are Carp to 40lbs in the lake, with plenty of 20’s. For the time being all I could see was shoals and shoals and shoals of Roach and Rudd cruising through the top layers. I found a quiet corner with and island feature and a reasonable margin and decided to set up camp. The point of the island was 12.5 meters and the margin feature was 2 + 2. I would also trial an open water swim at 6 meters, although after throwing in a handful of maggots and seeing the water boil with feeding silver fish, I may end up being plagued by little fish rather trying to get through to the bigger ones. 1 x 3.2lb Matrix Micron Power straight through to a 0.4g Rizov float to a size 16 Kamasan B911 – For Maggots and Casters. I had a plumb around and found 2 slight ledges – this is where I would aim to fish. Also if fished any closer to the island there could be potential bush interference (tangles). As I started on single red maggot, a chap to my right hooked a carp from the margins on pellet, a fish of around 5lbs graced his net. My bait had touched the surface which a roach darted out and grabbed the bait, all before I shipped out or my float had cocked. Instead of shipping out to mid distance I stayed on the top 3 for 20 minutes. Catching Roach and Rudd, one after another. It was unbelievable how many fish were in this lake, some of which would even take bare hooks! In-between catching these fish I would ping some pellets across to the island, as well as balling in a few dampened micros into the margin. 30 minutes and 102 fish later (I lost count after 102) I decided that was enough silver fish, I swapped topkits, hooked on a cube of meat and shipped over to the island. The bites instant stopped. Hopefully the meat would dissuade the smaller fish, although they were moving over there as well. After 4 or 5 minutes and only a few indications, I moved my rig to the island point almost underneath a bush and after 30 seconds the float slipped away. 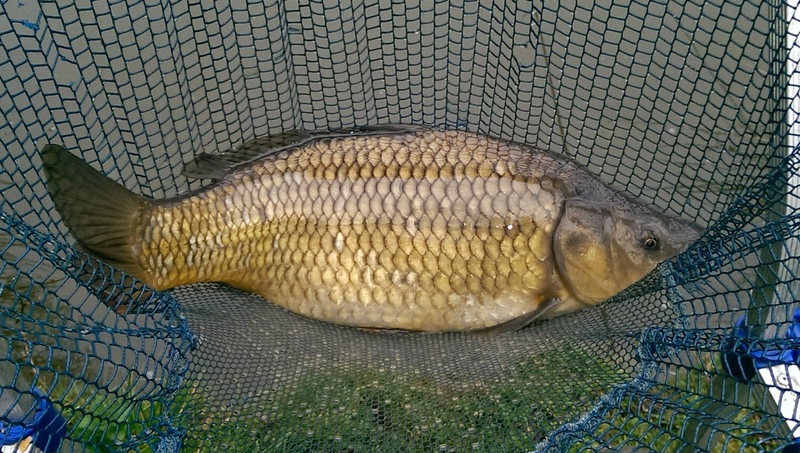 I was into a carp of around 5lbs, which after and attempted surge around the island I managed to get it into the net. I pinged a few more pellets over and shipped out another meat cube. That was almost that really, apart from a quick foray into the margins which yielded a nice Roach I stayed out on the island point all day. I managed 6 carp on the 14 topkit before “crunch”. I couldn’t see any damage externally but holding it and given it a gentle squeeze I could hear something crunching around on the inside. I believe my though was “Bugger!” Now I have to fix that, it’s an old pole, and the only sections you come by are second hand. This may be a slow beginning of the end for my warrior of a pole. Anyway, that topkit went back on the roost and I swapped over to the 16 elastic. Shipping back out I was into a fish within minutes, but on shipping the fish in I noticed the bush moving very oddly. On closer inspection someone had lost their rig and hook in the bush and somehow the hook had fouled into the back of a carp. The rig was well a truly lodged and the carp was pulling the bush every which way, in all honesty is was a bit distressing. I swapped rigs to a very short and very strong hooklength and shipped out. After a bit of jiggery pokery I managed to tangle my line around the snared rig and after a bit of a heave, the snared rig snapped, and I was pulling in my elastic, a tangled hooklength and a foul hooked fish. Fortunately the damage wasn’t great but the fish was knackered, and needed a good few minutes in the landing net the calm down. I let him go and continued fishing. The lake seemed to be alive with fish, and an angler down the bank gave a shout of “Pike!” Something I later observed under my own feet. 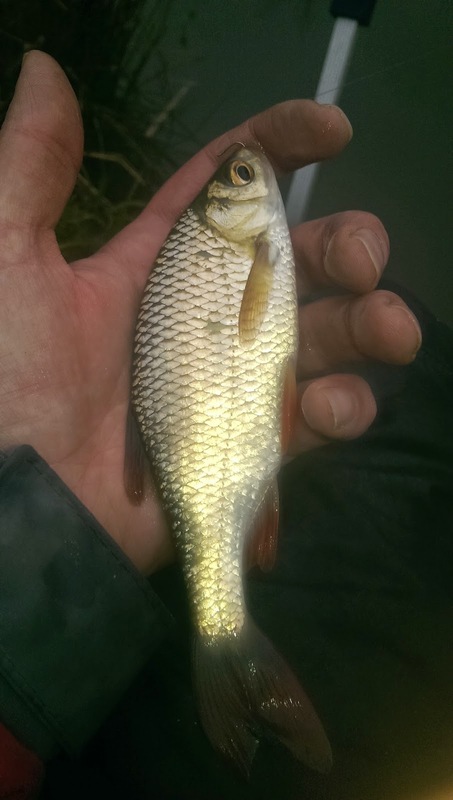 I scaled down the size of meat cube from a 10mm to 8mm and before long was landing the biggest Rudd of the day. So scaling up from 10mm to 12mm cubes I continued to catch a few more carp, but after another 5 I set up a plain lead rod with haired meat. Despite casting to within 1ft of the island I couldn’t get under the bush I had been previously targeting and despite several liners on the feeder rod I saw the day out catching a few Rudd. I called it a day at around 3pm after 4 and bit hours of fishing and couldn’t believe the few hours I had. I chucked my maggots and casters in to one box and lobbed them out a few feet from the bank. Watching the fish gobble up the loose bait I saw a black shape shoot out from the reeds on the right snap up an unsuspecting rudd, scattering the other fish in the process! 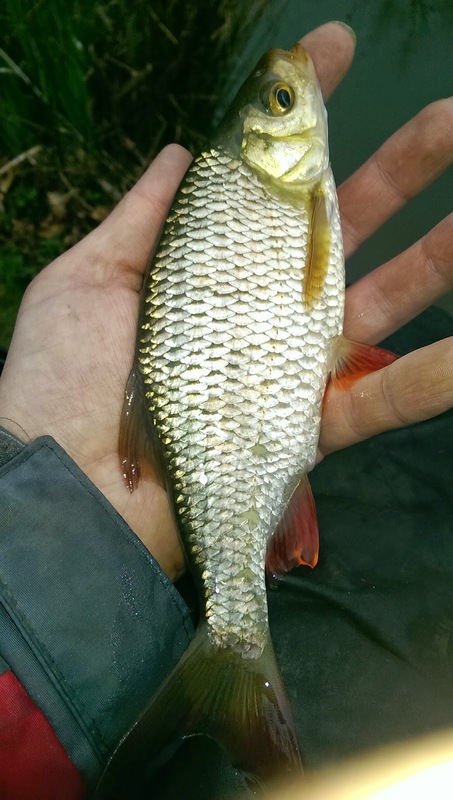 One of the resident Rudd the evaded the Pike. Lyon’s Gate seems to be a great fishery, and I only sampled one lake. After catching 12 carp, the biggest being around 9lbs (not a 20 in sight) I left feeling very pleased (but also slightly sad about my topkit), and when I remembered the cost of the day ticket (£5) I felt even better. It really is a great place, and if I had a caravan on that site I don’t think you’d get me off the lake! I spoke to the owner who told me there are a good head of bream and tench in the lake, but they come on the feed later in the season. There’s a tap where you can get fresh water drinking water, or ‘fill the kettle’ as the owner told me, and towards the start of the site there are also toilets. I would say that the lake is fished primarily by carp anglers, but you could very easily bag up on silvers if you wanted too. Access with a wheelchair might prove a bit difficult as some of the banks were waterlogged as I walked around, but there are one or 2 pegs which could be accessed with a chair and some assistance. Fishability – **** Lots of options whether you silver fish bash, or after some specimens. Disabled Access – ** – Unless we’d had a prolonged dry spell where the ground gets quite hard, pushing a chair around would be very difficult. Trip #3 – 10/07/11 – Leeds-Liverpool Canal – Kirkstall Breweries.